Why Has Meuller Not Recused Himself? Meuller has a personal and professional relationship with Comey. They are and have long been allies. 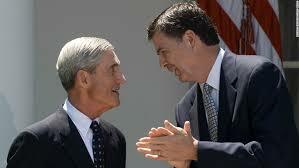 Comey regards his predecessor at the FBI as a mentor, while Mueller considers Comey his protégé. The law governing the special counsel (28 CFR 600.7) specifically prohibits Mueller from serving if he has a conflict of interest in the case. The rule has been interpreted to mean that even the appearance of a conflict is sufficient for disqualification! So what constitutes a conflict; “a personal relationship with any person substantially involved in the conduct that is the subject of the investigation or prosecution” (28 CFR 45.2). Comey is that person. Mueller has no choice but to disqualify himself. The law affords him no discretion because the recusal is mandatory in its language. It does not say “may” or “can” or “might”. It says the special counsel “shall” recuse himself in such instances. The fact that Meuller has even allowed the idea that he would take on this “investigation of the president” coupled with the fact that he has not recused himself bodes ill. If Meuller is willing to disregard the the law concerning his participation in any investigation involving his “protege” his credibility is zero!